The annual Stagecoach student prize draw has been claimed. Stagecoach East Scotland presented St Andrews University student Laura Dewhurst with her prize this week. Stagecoach East Scotland have introduced 6 brand new luxury coaches into the fleet to operate on Express services across the region. MSPs have backed Scotland's buses as a means to help tackle growing concerns over poor air quality and crippling congestion in towns and cities across the country, according to new research. 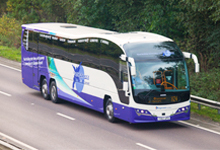 Stagecoach have launched a promotional offer with St Johnstone Football Club to provide Season ticket holders with travel discount to reach the home ground at McDiarmid Park. Stagecoach East Scotland bus driver Graeme Gilfillan has been awarded 6th place at this year's UK Bus Driver of the Year awards.